Reports from China suggest journalists at a newspaper embroiled in a censorship row are returning to work after an agreement was reached. Staff at Southern Weekly had demanded that a top propaganda chief step down after a New Year message was changed. Reports said that the provincial Communist Party chief, high-flier Hu Chunhua, had intervened to defuse the situation. The row was a rare public clash between journalists and the authorities. 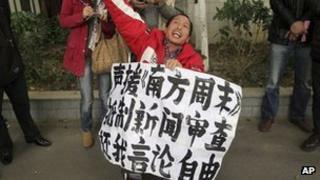 It provoked reaction online, leading to small protests outside the paper's Guangdong headquarters and an apparent show of support by several other news portals and publications. The row began when a New Year message in the paper - a well-respected publication also known as Southern Weekend - that had called for guaranteed constitutional rights was changed by censors prior to publication. Staff wrote two letters calling for the provincial propaganda chief, Tuo Zhen, to step down. Another row then erupted over control of the paper's microblog when a message was posted denying that the piece had been changed, and a number of staff went on strike. On Tuesday, an editorial from the state-run Global Times blaming the incident on "activists outside the media industry" was republished on multiple news sites - the result, according to reports, of a government directive. But several major news portals carried a disclaimer saying they did not endorse the piece and a number of newspapers did not run it, in an apparent show of solidarity. Reports citing sources both from the paper's staff and people close them said a deal to end the dispute was agreed on Tuesday evening. Thursday's edition would be published as normal and most staff would not be punished, Reuters reported. Other details of the agreement are not clear. However, online reports citing microblogs suggest the row may have widened to include a well-known daily, Beijing News. Unconfirmed reports said its chief editor, Dai Zigeng, had resigned over pressure to publish the Global Times editorial. The Beijing News belongs to the same media group as the Southern Weekly. However, when the BBC visited the Beijing News offices, the chief editor's office manager and several of the paper's journalists issued assurances that Mr Dai was still at work. Reports that protesters were camping outside the Beijing News offices also appeared to be untrue. Nonetheless, a careful reading of the Beijing News fuels speculation that something is afoot at the paper. The main page of its website features a story on the wonders of warm rice porridges from southern China that can soothe the soul in the depths of winter. "During social disturbances, we should really cherish warmth and this bowl of porridge," the article reads. Correspondents say that it could be interpreted as a show of support for Southern Weekly. In another editorial on the subject, meanwhile, the Global Times said that press freedom "must have limits". "It is simplistic to think that China's news management system only protects the interests of the government," it said. "China's news management system is walking a difficult tightrope between the nation's development and the development of its media."